Compact Dry ETB is a ready to use, selective plate contained glucose for the detection and enumeration of Enterobacteriaceae. Results are available in 24-48 hours and are incubated at 35-37°C. The Compact Dry ETB medium contains chromogenic substrate by which the colonies are coloured a purple red colour. The plates can be kept at room temperature for up to 12 months after production. Each foil bag contains 4 tests, ideal for small or infrequent users. Easier and faster to use than any other method. No height limits when stacking for incubation. Open aluminum foil and take out the set of 4 plates. Detach necessary number of plates by bending up and down while pressing the lid. Take off the lid of the plate and pipette 1 ml of sample in the middle of the Compact Dry plate. 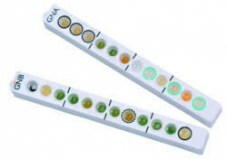 Sample diffuses automatically and evenly across the sheet, transforming the dried sheet into a gel within seconds. Replace the lid back on the plate and label. Invert the plate and incubate. 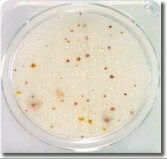 Count the number of colonies appearing on the medium from underside of the plate. When the number of colonies is high, it is convenient to use the grids carved on the back of the container consisting of 1 cm x 1 cm or 0.5 cm x 0.5 cm.